A new fund aimed at assisting regeneration of the Pulteneytown area of Wick will help see fifteen local people trained over the next three months (October to December) in the 'Principles of Retail'. A ten week course has been set up by North Highland College with Scottish Executive Community Regeneration Funding, and targeted primarily at unemployed people living in the Pulteneytown area of Wick. Having completed the course, the students will be better equipped to gain work in the new retail developments coming to Wick - Argos, Homebase and Tesco. The course is also being supported by Jobcentre Plus. Donald MacBeath, Depute Principle of North Highland College said: "Pulteneytown is an area of high unemployment and we are delighted to be able to offer this opportunity to Pulteney residents as a result of the Community Regeneration Fund grant. This City and Guilds qualification is just the first in a series of retail training the College hopes to be able to provide and will help people seeking work both with existing Caithness retailers and in the proposed new retail developments at Wick." 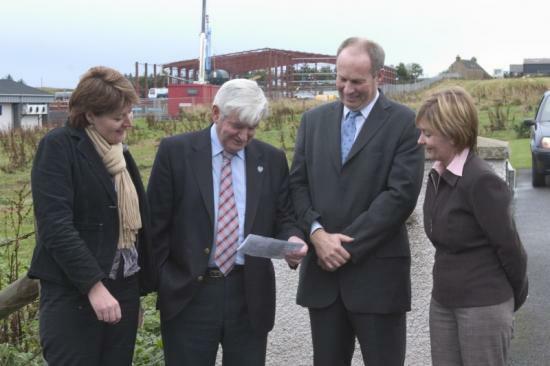 Councillor David Flear, Highland Council's Area Convener said: "Local administration of the Community Regeneration Fund is an excellent demonstration of community engagement in the Caithness community planning process. Through this training that is assisted by the Regeneration Fund, I hope that every student secures employment in the new retail developments coming to Wick." Anna MacConnell, Caithness Partnership Co-ordinator said: "The Caithness Partnership is responsible for managing disbursement of �60,000 per year of the Scottish Executive's Community Regeneration Fund in Caithness over the next three years 2005/06, 2006/07 and 2007/8. "To ensure local governance of the Fund the Caithness Partnership has brought together a group of agency and voluntary sector representatives who work with the Pulteneytown community, and they will provide guidance and ensure that the money is spent on activities which will have maximum local impact. "This year, �8,000 has been awarded to Pulteneytown People's Project towards the employment costs of a Youth Worker and �7,500 to North Highland College to assist with the cost of running the Retail Principles course." Caithness Partnership is the Community Planning Partnership for Caithness. Its main role is to develop community planning in the County and to act as an umbrella body for community planning activities in the area. The Community Regeneration Fund is a Scottish Executive grant of over �600,000 per year which must be targeted at the 15% most deprived data zones in Scotland - of which Pulteneytown in Wick is one. Congratulating the North Highland College, George Bruce OBE, Chairman of the Caithness Partnership said, " We are delighted that the College has taken the lead to provided the Retail Principles Course and hope that funding will be available in the future to train more workers to take advantage of the increase in retail jobs in the county." Rognvald Taylor, Assistant Principle, North Highland College, Highland Councillor Katrina MacNab.